QUOTE OF THE DAY: Decide today that you will eat only food that loves you. You know better than anyone else what is best for you. ~ Louise Hay and Robert Holden from a book called Life Loves You. THOUGHT FOR THE DAY: I stumbled across this book a while ago and got a discounted audiobook version of it. I mostly listen to it when I can’t sleep at night. It’s an interesting book. It also comes with some affirmation cards which you know I am a BIG FAN of. Speaking of nutritious food, I wanted to post my current smoothie recipe for you. I call it Matt’s Motivational Monday Power Smoothie! PURE Greens and PURE multivitamins available for purchase from me! Comment below if you are interested…. I drink this smoothie every morning to kick start my day with a good nutritional kick of awesomeness! 1) I enjoy the foods that are best for my body. I love every cell of my body. 2) Water is my favorite beverage. I drink lots of water to cleanse my body and mind. 3) I am grateful to be alive today. It is my joy and pleasure to live another wonderful day. QUOTE OF THE DAY: To intentionally pass on opportunity is to intentionally pass on living. Wow. That quote really hit me in the gut. I was like wow. It goes along the same lines as don’t give up! If there is something that you feel you were put on this earth to do, go for it. Do it now. Don’t waste any more of your precious life and your precious time on this earth. Give yourself to that experience. Every day is a precious gift. This awesome and amazing moment right here followed by this awesome and amazing moment. It’s all a gift from God. Be blessed. Be awesome. Just Be. Just be yourself and don’t apologize for it. 1) I am responsible for everything in my life. 2) I take responsibility for my dreams. 3) I am responsible for my feelings. QUOTE OF THE DAY: The thing about meditation is you become more and more you. THOUGHT FOR THE DAY: I have learned a lot about myself through meditation. I use a lot of guided meditations in the morning when I first wake up. I typically will wake up, drink some water, go to the bathroom, and then throw on my headphones for a guided meditation. There is a definite calming effect from this practice. There is definitely a way that things that you listen to over and over have a way of seeping into your subconscious. I will often repeat to myself some of the things that I listen to in the morning throughout the day. I would highly recommend insight timer. It has literally thousands and thousands of different meditations to chose from and I love that about that app. Now I am not an expert on meditation in any way shape or form, but I do enjoy guided meditation. Other forms of mediation which I don’t practice as often, but have done in the past is simply just sitting quietly and listening to your breath. If you just try that you might learn a lot about yourself and your life. Start with 5 minutes of just being with yourself and in your body and listening to your precious breath. In addition, I think running for me can be a meditative practice as well. When I run my mind works out a lot of problems and has new ideas and goes to a really interesting and creative place. What lessons or things about yourself have you learned lately? What experience have you had with meditation? Have you ever tried meditation? What kind of questions do you have about it? This week may you be well, may you be healthy and may you be centered and feel alive more with every breath. May you cherish the gift of today. May you learn more about yourself through meditation. May you love yourself and love others. 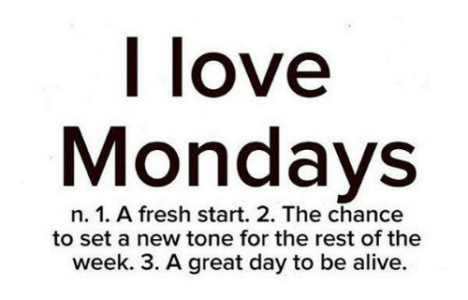 Happy Monday and let’s have a great week! QUOTE OF THE DAY: Improve 1% every day. THOUGHT FOR THE DAY: Imagine if you improved one thing in your life for the next year by 1% a day. What if you just took one little step towards that goal every day? Consistent hard work over time equals improvement. It equals amazing. It equals a better you. It equals better nutrition, better mental health, or a better relationship. Or whatever else that goal is. That is exactly what I have done with Matt’s Motivational Monday email list and website and now facebook page. It is consistently taking the time to do what you are passionate about and continue to keep doing it time and time and time again. Eventually, you will see the results you are looking for. I recently did the lifetime indoor triathlon where you have 10 minutes to swim as many laps as you can, and then 30 minutes to bike as far as you can and then 20 minutes to run as far as you can. The last time I did that race I swam 15 laps in the pool. This year I did 17 laps in the pool. That was improvement. I would dare say that is a little more than 1% improvement. Maybe it’s not 37 times improvement either. It is somewhere in the middle, but then again I did not work for an entire year at the swimming. But you get the idea right? This week may you improve 1% in your steps taken, in your miles walking, in your healthy eating, in your meditation, in your journaling efforts, in your exercise, in your dreaming or in whatever area of life you want to improve. Follow the path that is in front of you. Keep trying. Keep improving a little each day. 1) Every day, in every way, I am getting better and better. 2) I wish the best for everyone. 3) I must be the change I wish to see in the world.